MASON — A drug arrest Saturday night in Mason led to a police officer being hospitalized, when he allegedly came in contact with fentanyl. 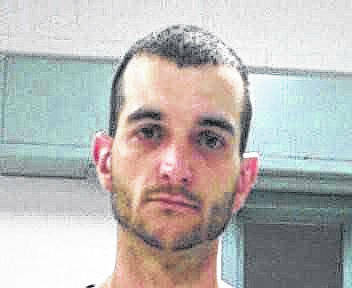 Nathan D. Keffer, 30, of Mason was arrested by Mason Patrolman Kendall Roush on two counts of possession of a controlled substance and obstructing an officer. He remained in Western Regional Jail on Monday on a $5,000 bond, set by Mason County Magistrate Gail Roush, according to Police Chief Rich Gilkey. Gilkey was transported to Pleasant Valley Hospital following the arrest. He was hospitalized overnight and tested positive for fentanyl, after reportedly coming into contact with wet cotton balls the suspect was carrying. Also at the scene was West Virginia State Police Trooper G.C. Burnem, who Gilkey credited with quick action in recognizing the symptoms of his alleged exposure to the drug. According to the police report, Patrolman Roush stopped a Ford Ranger after it turned off of the Bridge of Honor allegedly without signaling. The driver and two passengers were also reportedly not wearing seat belts. After the driver gave consent, Chief Gilkey attempted to search Keffer, who reportedly became agitated. Gilkey physically restrained Keffer, and a needle, suspected heroin, suspected suboxone, and a plastic bottle cap with cotton balls, soaked in suspected heroin and fentanyl were allegedly found, according to the chief. Gilkey said after accidentally coming in skin contact with the cotton balls, he began feeling dizzy and disoriented prior to the squad being called. Additional charges are possibly pending against Keffer, Gilkey said.